In sound condition, a rare circa 1785 British Infantry Officer's 5 Ball Long Spadroon Sword With Antler Grip. With a massive 35 inch blade (most infantry sword were 30 to 32 inches at that time), long enough to rival a cavalry sword for its length, this very bespoke antler / stag horn grip 5 ball spadroon obviously was once owned by a very tall British infantry officer. 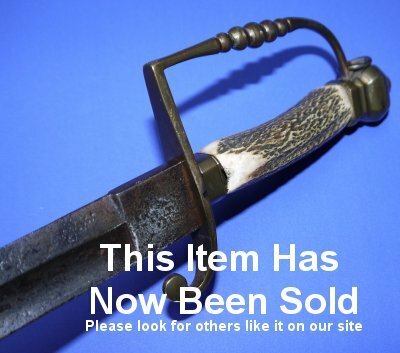 A very unusual / bespoke and with it rare pre-regulation sword. The 35 inch blade has patina and former (inert) rust pretty much throughout its length but is in sound condition. The blade is firm in the brass 5 ball hilt, which itself is in good order. The stag horn grip is very good. There is a small recess in the hilt's cross guard which likely once held a motif / cartouche, if only we knew what it was! Try and find another! What a great buy at just £600. Please quote item reference U66. Further / full sized images available upon request. Box 0907-121x17x17 (1.780).